Congratulations. Nothing like arousing the chatter of admiration, worse if it's scorn, but of course it wouldn't be that, not alongside those others. Yes, the company is pretty illustrious all right. Now if only you'd worked into your subtitle "The secret love tapes of Michael Jackson", you'd be cresting on Google trends as well. Ms WV just asked me to write 'hiesityl'. Working on getting it now - with a Glenmorangie Quinta Ruba in one hand, a jazz cigarette in the other and the mouse in the third. I'm drinking brandy, myself. If I'd known I was going to make this curry, I would have bought some beer. Good review in yesterday's InDaily too. Really, Phill? Thanks for the heads-up -- but I can't find it! Congratulations! That's great news. 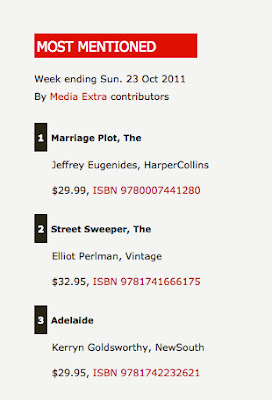 Now for a byline about a street-sweeper getting married in Adelaide. Sorry Kerryn, a bum steer. It was Wednesday's. Here's the link. Thanks Phill, I tracked it down. Have been amused by the several people (all men) including this dude complaining that I didn't write about sport. The two or three times I have written about sport in the past, certain men have fallen over themselves in their eagerness to tell me that I've Got It All Wrong. El, yes, that would work. Or perhaps a screenplay? I've read the illustrious work until I reached "cattywampus". I'm now on high alert for any other feline words that PC has snuck in. Google it! It's a perfectly cromulent word. Encouraging to see you've resisted the temptation to skite. Am embiggened, for this discovery that this cattywumpus is cromulent, but fear for its comfort and sense of well- being. So what DOES he think it is?